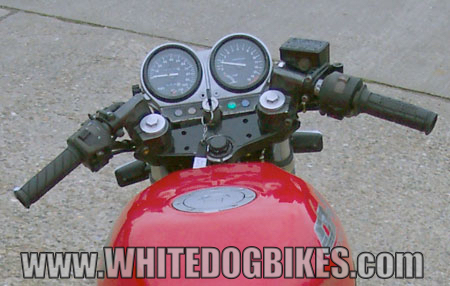 The bike was also known by it’s official Honda model code (NC27) and as the CB400F in some countries it was marketed in. The CB1 was originally released in Japan, but was later also released in the USA and Canada. 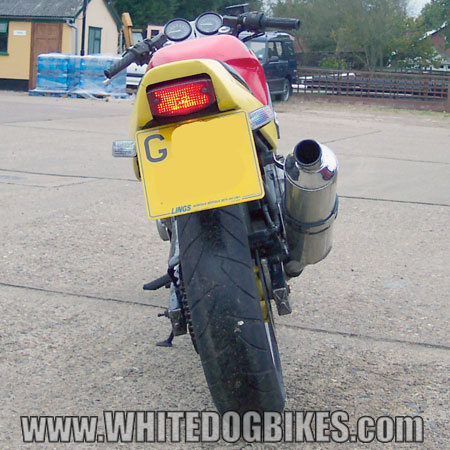 The CB1 was a fairly ‘sporty’ feeling bike, with a small and compact design and an engine based on the fully faired CBR400 NC23 (although the engine was de-tuned for the CB-1). 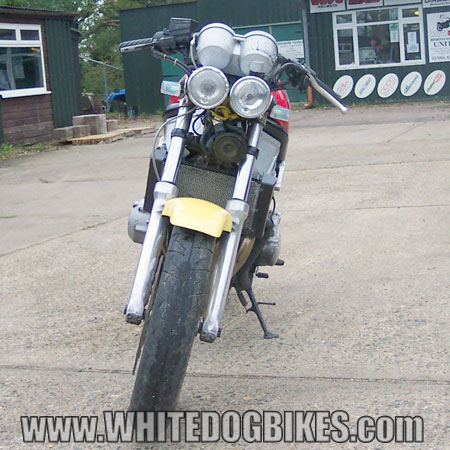 A little bit about the Honda CB-1….. 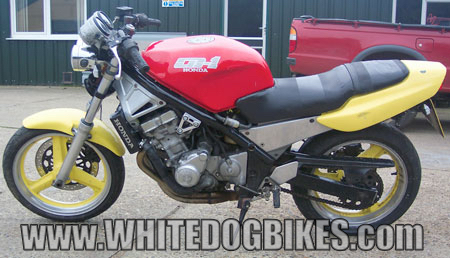 Note: The CB-1 was a ‘grey import’ in the UK, which means it was never officially released by Honda in this country. The bike was available here, but not new from Honda (models available would have been registered in other countries where it was officially released and imported 2nd hand to the UK by importers, dealers and private individuals). Description: Unfaired 399cc bike with 17 inch front and rear wheels, Showa 41mm front forks, single front disc brake and a engine based on a de-tuned NC23 engine. Honda CB1 front view. Fitted with aftermarket headlights. 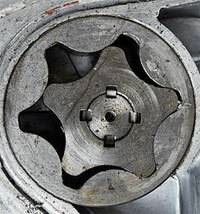 Note: A Trochoid oil pump has an inner and outer rotor with different numbers of teeth (e.g. the outer rotor can have 5 teeth and the inner can have 4 teeth). 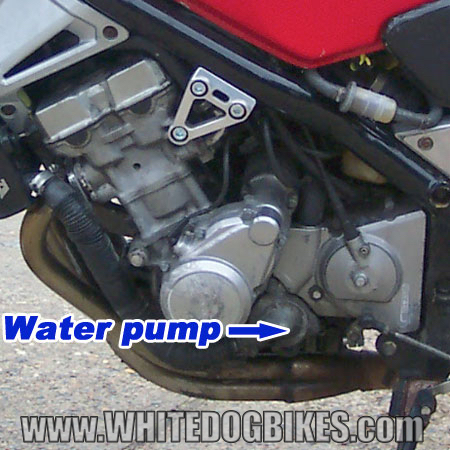 The difference in teeth creates uneven spaces inside the pump which causes the oil to move to fill the gaps as the inner rotor rotates (example below, not from a Honda engine). 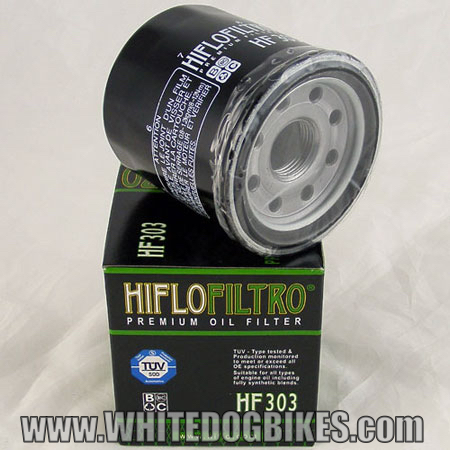 Unfortunately, these pumps do suffer from pitting if the incorrect oil has been used in the engine (e.g. car oil). Note: BHP, torque and top speed figures are ‘claimed!’ based on Honda marketing stuff (it’s not uncommon for manufacturers to inflate these figures as it helps sell more bikes!). The frame number is stamped onto the right side of the headstock (the front part of the frame just below the handle bars). 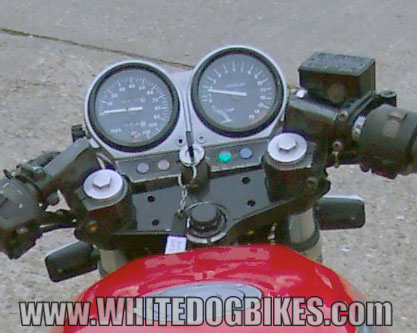 There is also a information plate on the right of the bike, on the frame just behind the headstock and just below the tank. On the right side of the engine crankcase, just behind where the clutch cable joins the clutch arm (the engine number usually starts ‘NC23….’. 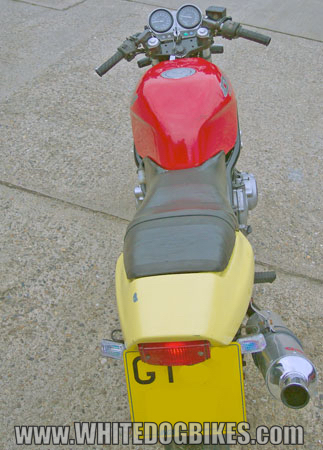 Although the CB-1 wasn’t a popular bike for Honda, it has proved popular in other countries where it was officially released and in countries, like the UK, where it was imported as a ‘grey import’. The CB1 was released at a time when the market was changing and people weren’t looking for sporty. unfaired bikes and were looking for sportier, fully faired bikes (e.g. CBR400, CBR600 etc). This meant the CB1 was a hard sell for Honda. 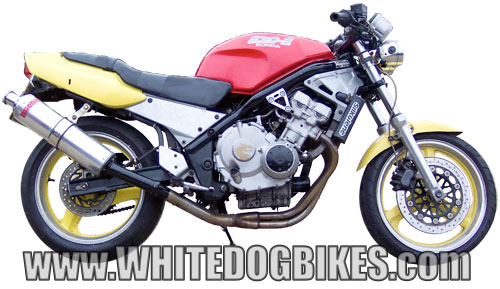 Officially, the bike was sold between 1989 and 1990, but it was available new up until 1992 in some countries at a discounted price to clear stock (the bike was known as the CB400F in the US). The CB1 has proved popular with newer, 1st ‘big bike’ riders, couriers and, due to it’s smallish size and low seat height, shorter riders. The sporty ride of the bike is achieved, it part, by the frame design and clip on handle bars (as opposed to more traditional handle bars used on many ‘naked’ bikes) and the use of an engine based on the CBR400RR NC23 engine. 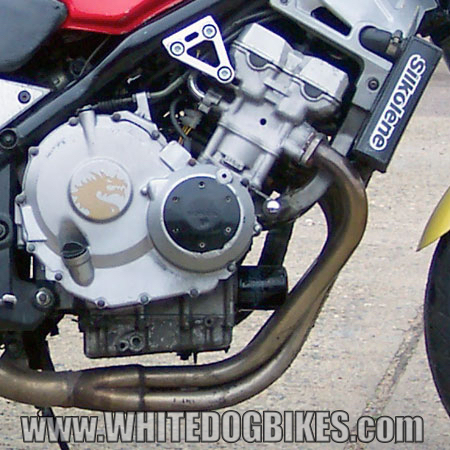 The CBR400 engine was de-tuned for the CB-1, with changes to the port lengths as well as smaller valves and lower compression ratio. Other changes were in the primary and secondary gear ratios which meant the 1st gear speed was reduced from 60 mph (in the CBR400) down to around 30 mph (although this meant the CB1 was quicker off the mark then the CBR400!). 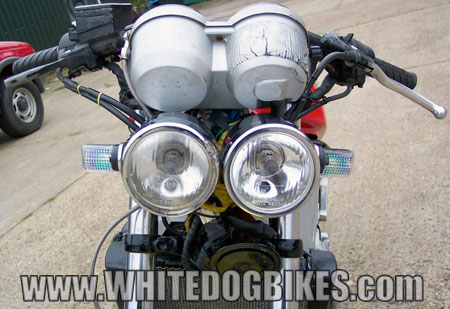 Although never official in the UK, there have been many CB1’s with upgrades and extras over the years. 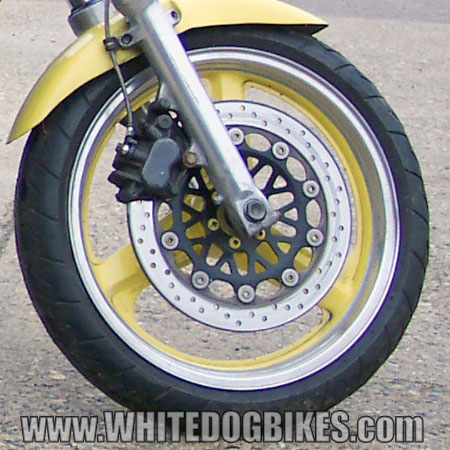 Many have been modified with a CBR400 forks and front brake system, which converts the single front disc brake to a twin front disc brake, as well as braided brake hoses, performance and home made exhaust systems and other parts. These are good, solid bikes and are ideal for 1st time ‘big bike’ riders as well as shorter (lady) riders. Mileage isn’t really anything to worry about (within reason! ), but obviously a bike that’s had frequent oil changes is likely to be better. Obviously, the youngest of these bikes will be 27 years old now so if your buying you’ll need to check any metal parts, especially exhausts, forks and similar (also check the availability of parts as grey import bike aren’t always the easiest to get parts for!). 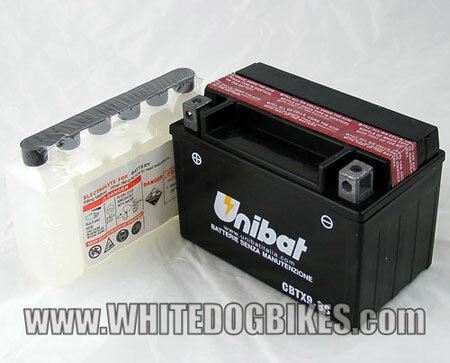 Although the CB-1 is fairly reliable (gear driven cams etc), there are a fair few ex courier and winter bike hacks around, which aren’t always a bad buy, but will invariably always need something doing to them. Common part’s like reg/recs, brake pads, clutches, chain and sprocket kits, caliper pistons where shared between a few Honda models to these parts aren’t difficult or expensive to source.